Happy Tuesday! 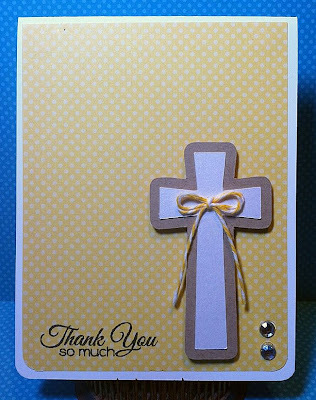 Today I wanted to share a card with you that I created using one of my favorite Jaded Blossom stamps.. Cheesy Pick Ups! 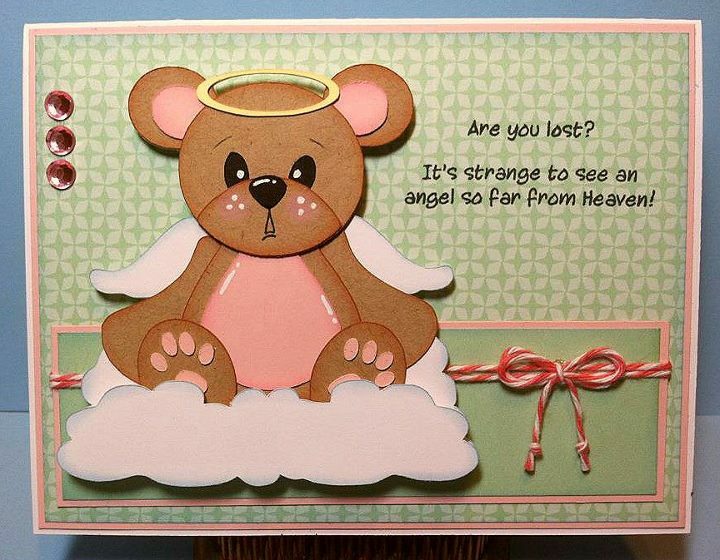 Sentiment reads.. "Are you Lost? It's strange to see an angel so far from Heaven!" 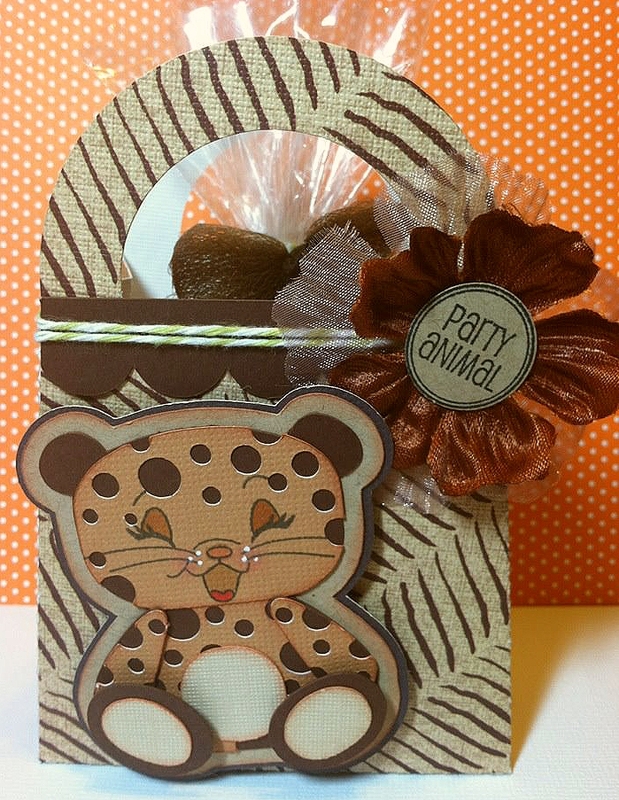 This cute angel bear is from Bear Hugs Paper Piecing. The paper is Echo Park and the cardstock is Paper Trey ink. I also used the new Strawberry Twine from The Twinery! Happy Friday! 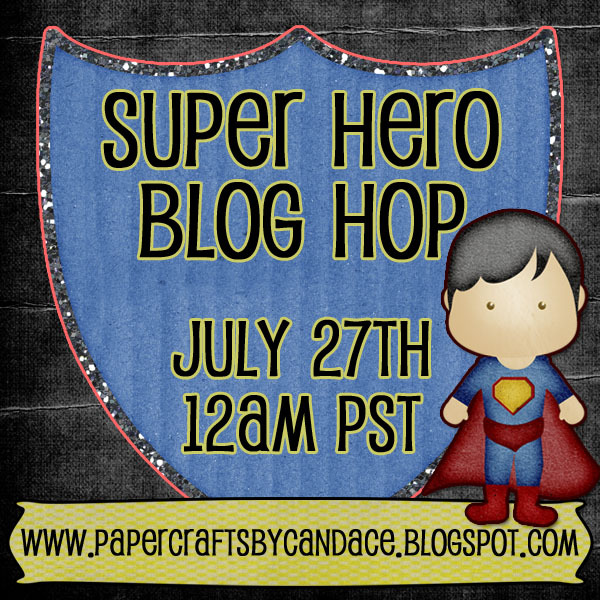 And WELCOME to the Super Hero Blog Hop! 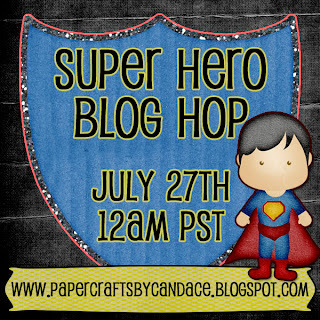 My friend Ruthie and I are total nerds and love all things geeky and super hero so we decided to co-host this blog hop! And I am super excited to share my project with you! 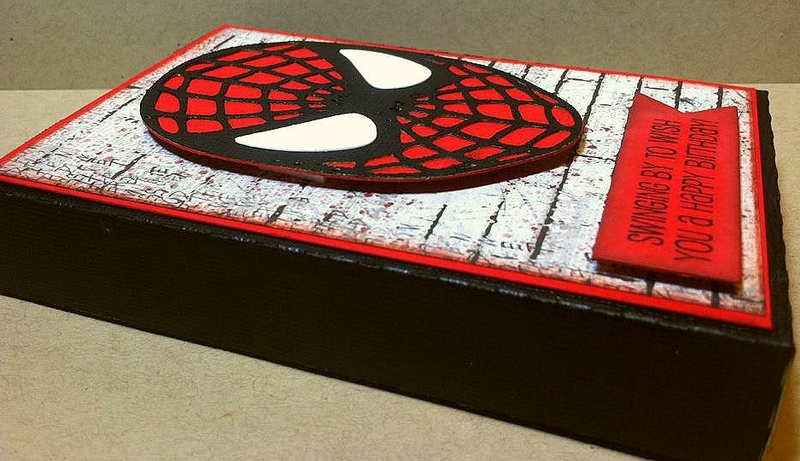 This is a Spiderman Gift Card box! I used Jaded Blossom's "Super Hero" stamp set for the sentiment. This stamp set is only $11.99 and has FREE SHIPPING this weekend only!! If you checked out my hop project yesterday you would of seen a Monkey project using the same sentiment! So many ways to flip these sentiments! 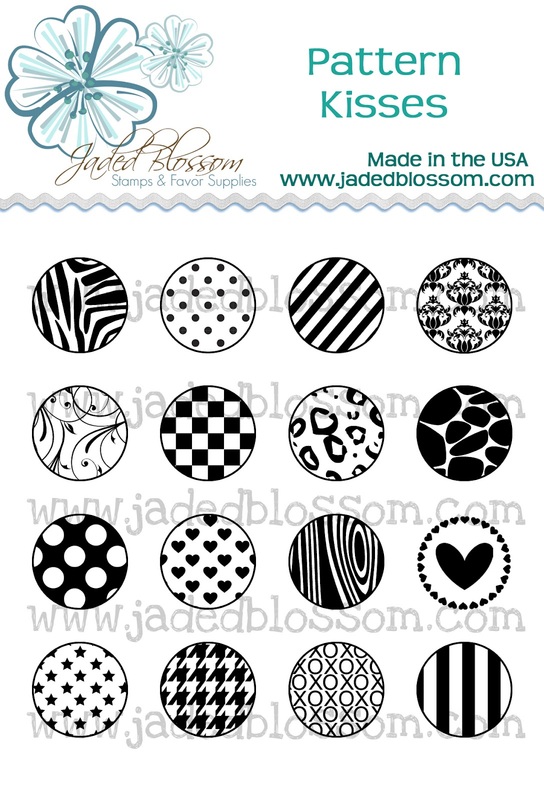 The sentiment is on the Jaded Blossom flag die. Here is a side view.. 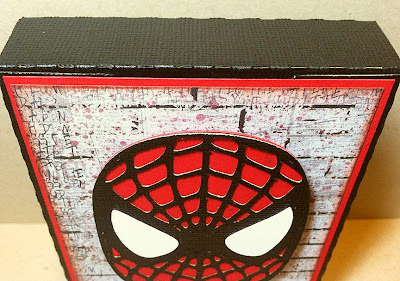 I cut the spiderman face out on my Cameo from a free file I found online. 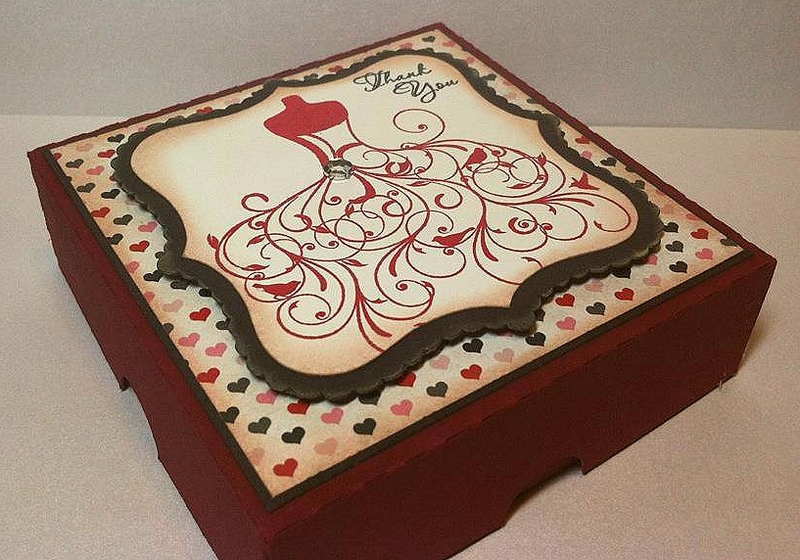 The box is also cut out on my Cameo from the Silhouette Store. And top view.. Isn't that brick paper perfect? I saw it and its what inspired me to create this project. I can't wait to put a gift card in this and give it as a gift to a nephew! 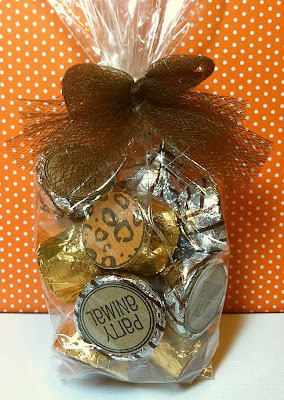 Now.. whats a blog hop without a prize?!?!? We are giving away this YourStory Photo Personal Bookbinding Kit! 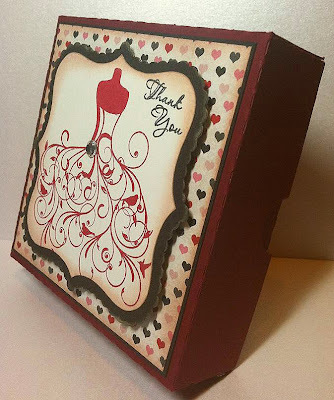 To be eligible to win you have until Sunday night at midnight to comment on all the blog hop participants posts. 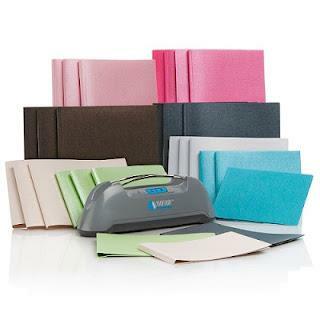 A winner will be selected at random and posted over on Ruthie's blog on Monday! Thanks so much for hopping with us! Here is the complete line up in case you get lost. Your next stop is... YOLANDA!! 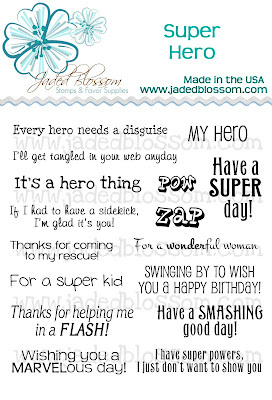 So most of you know I like nerdy things :) And well with all these super hero movies coming out I needed some super hero stamp sentiments for birthday cards etc! 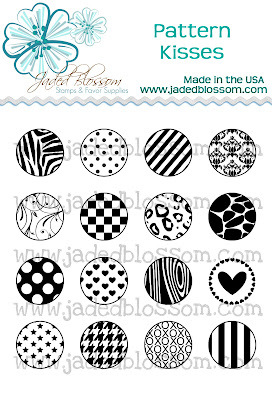 Being part owner of Jaded Blossom has its perks because wa-la.. here are those stamps!! I also know some of you right now are looking at this set going "I'm not into super heros so I won't use this". But guess what? 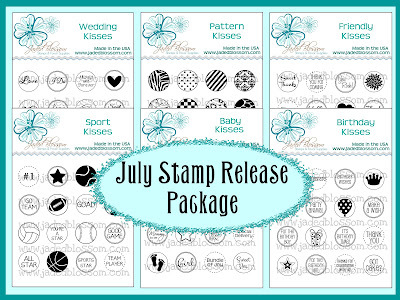 A lot of these stamps can be used for more that just super hero! AND I feel like I am ALWAYS making birthday cards for my nephews and my friends kids! 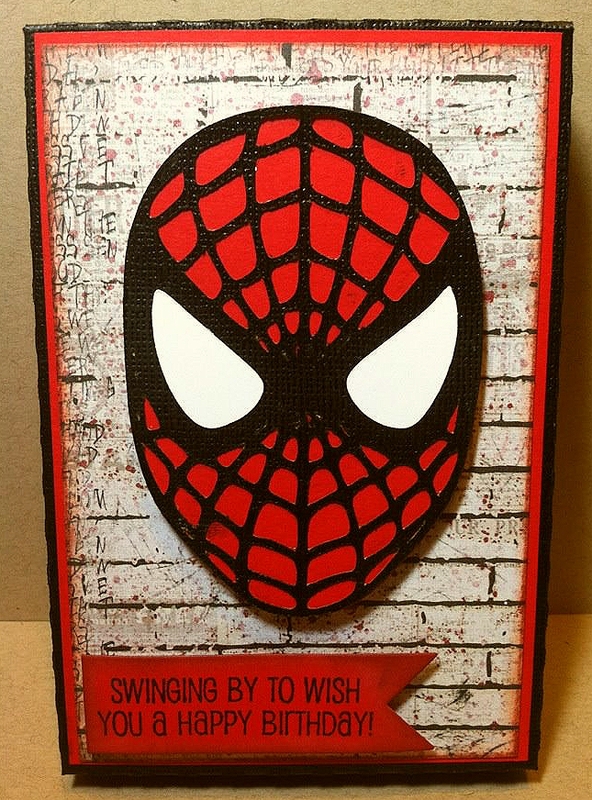 And now to bring you to my project..
"Swinging my to wish you a happy birthday" is from the Super Hero set and is stamped on the flag die. 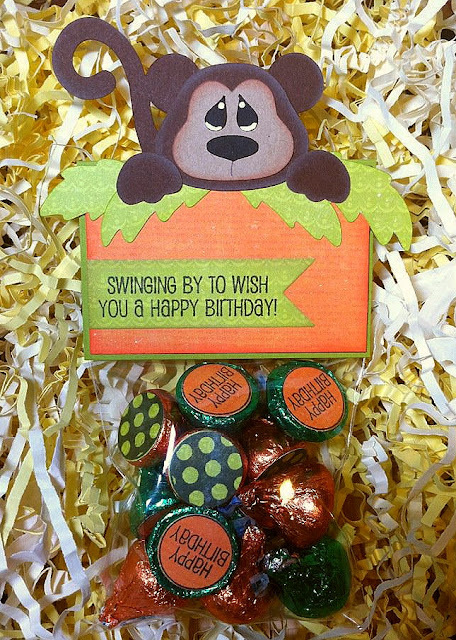 This cute monkey is from Treasure Box designs. I used Birthday Kisses and Pattern Kisses on the bottom of the hershey kisses. Yes I know they are currently sold out BUT will be back in stock in the store next week!! 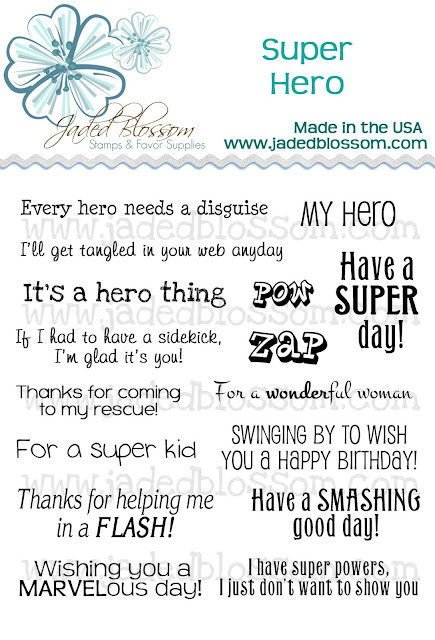 When you purchase Super Hero stamp set you get free shipping on your entire order this weekend only! So I am in another blog hop tomorrow.. a Super Hero theme and I will be using this same sentiment but in a super hero way this time!! Happy Wednesday!! 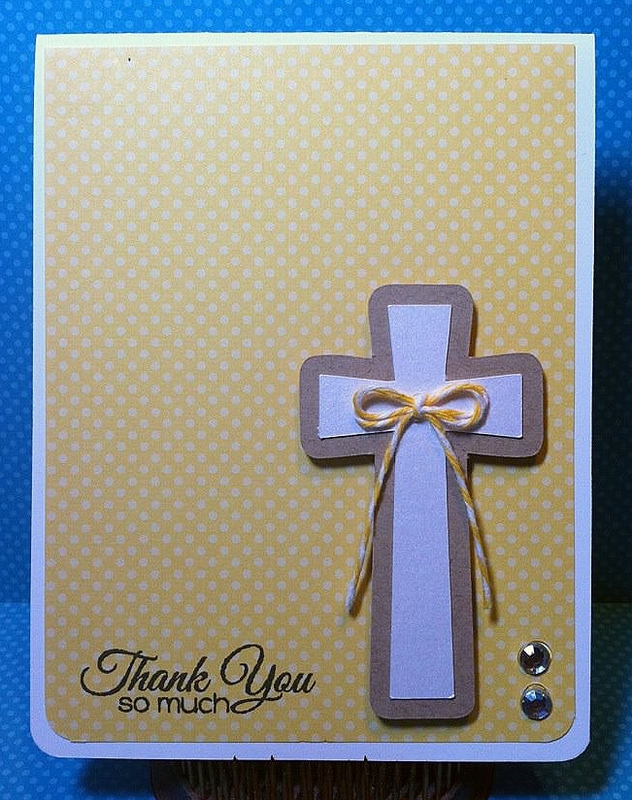 Here is a card that I created for my aunt's birthday! 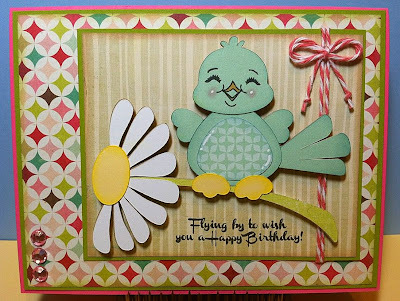 This cute little bird was a freebie from Treasure Box Designs awhile ago and I never got a chance to cut it until now! "Flying By to wish you a Happy Birthday" is from Jaded Blossom's "Bug-a-boo" stamp set. I also used the new Twinery color "Strawberry". 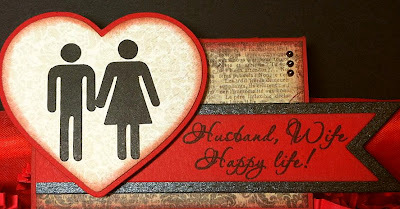 Thanks so much for checking out my blog today! 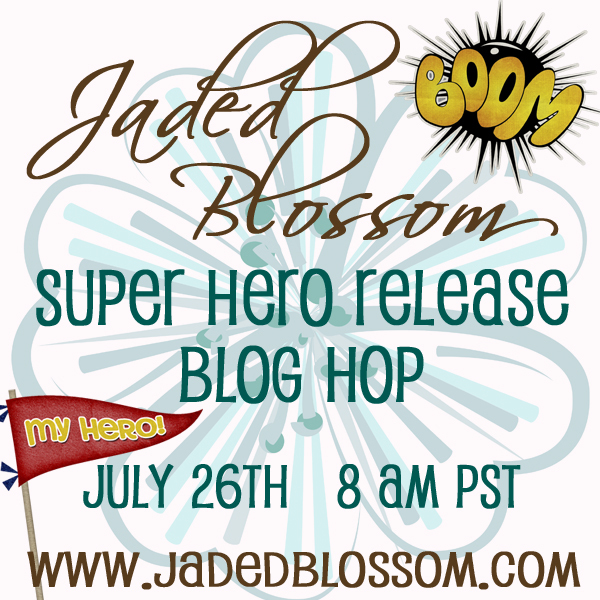 Make sure to come back tomorrow for the Jaded Blossom "Super Hero" stamp release blog hop with the design team! and then come back on FRIDAY for another Super Hero hop with some other friends!! Happy Tuesday! 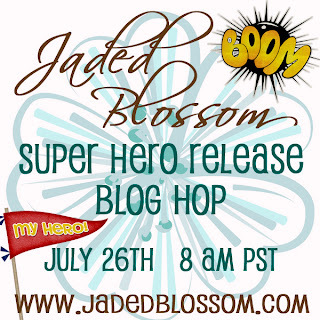 And its Super Hero week over at Jaded Blossom! 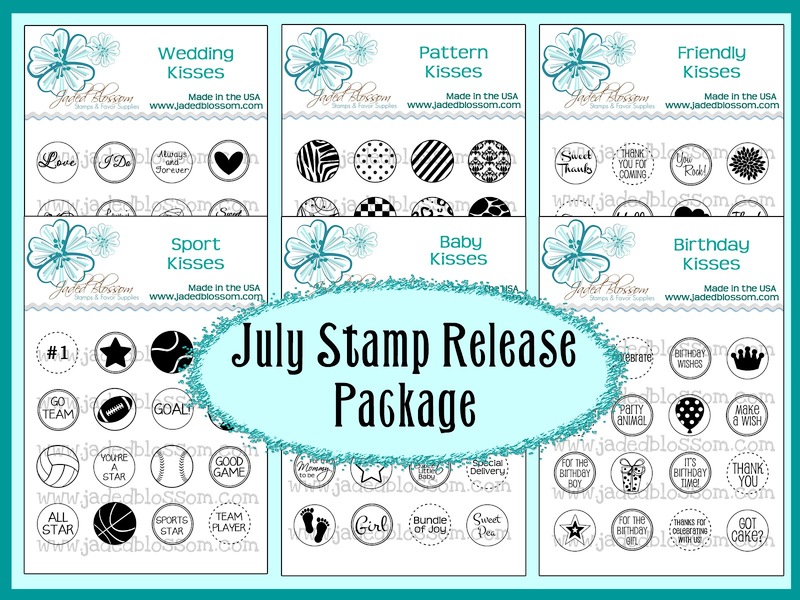 We are doing a special release with a Super Hero stamp set! Perfect timing with all the super hero movies out right? Spiderman, Batman, Superman..
Anyways here is my project! I made a hershey bar slider! 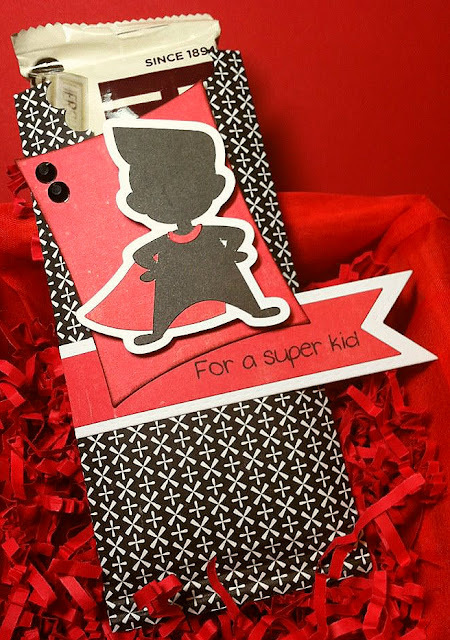 The hero kid is from Silhouette Studio and cut out on my cameo. 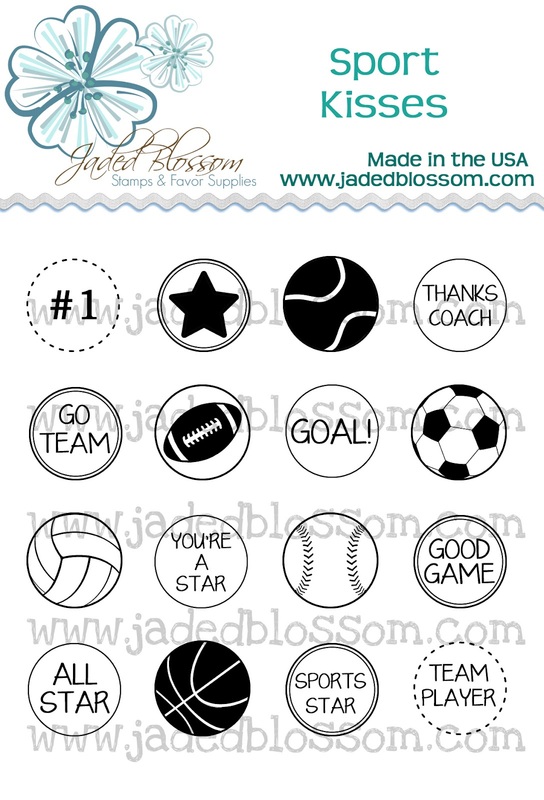 The sentiment is stamped on the Jaded Blossom flag die. Make sure to head over to Jaded Blossom to check out some other sneaks this week! Hi Everyone! Long time no blog! Some of you know I was on vacation in San Diego, California! It was so much fun. Me, my husband and some of our friends all went to Comic Con. I know it sounds nerdy but we go for the TV Shows, Movies and Celebs!! Anyways now on to my project! 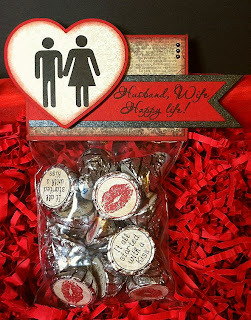 I made these hershey kiss bags using the new Jaded Blossom stamps and bags! 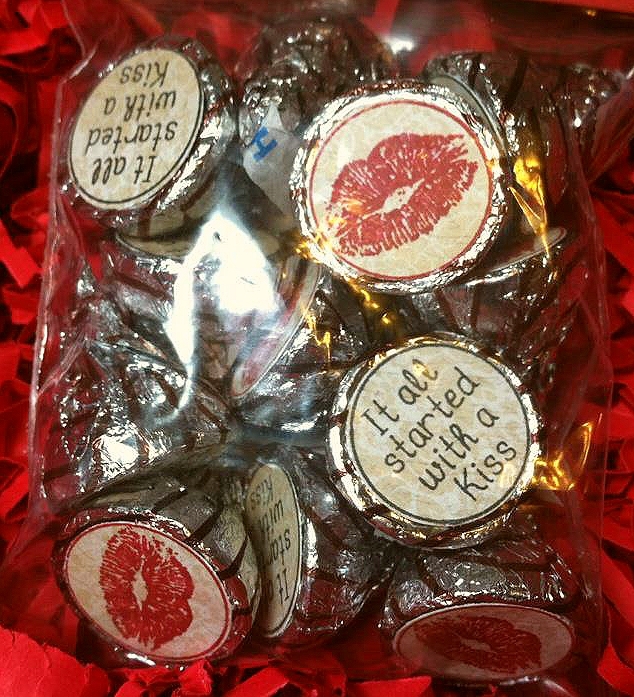 I used both Friendly Kisses and Pattern Kisses. Here is a close up. "Thank you so much" is from Jaded Blossom "Simple Sayings"
And then of course a simple matching card. Didn't want to do to much on them to take away from the cross. You can't tell in the pictures but I used shimery white paper. So pretty in person! Hi Everyone! Happy Thursday! 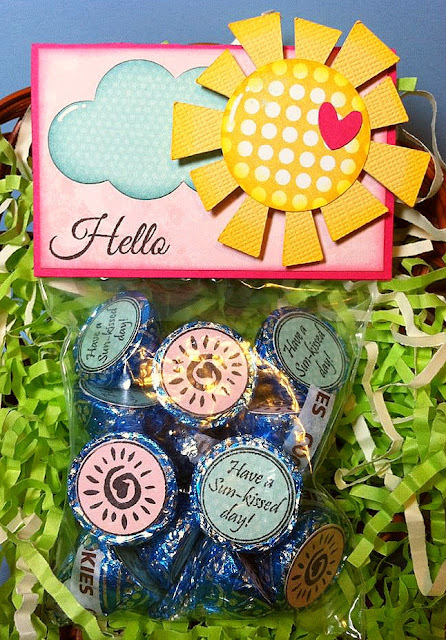 If you have arrived from Jenny's blog then you are in the right place. If not and you would like to start at the beginning please click here. I am sooooo excited this this months stamp release! 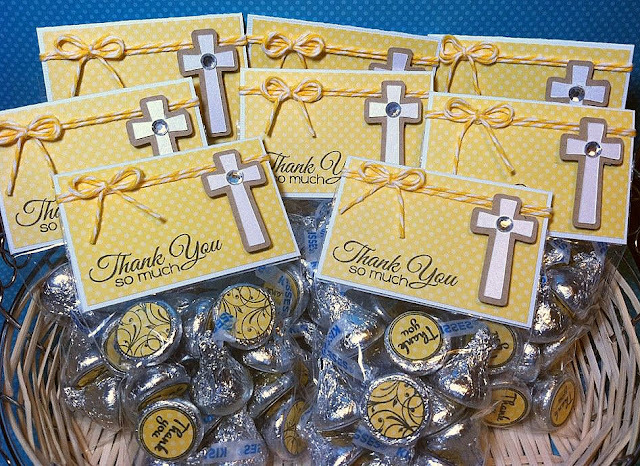 We've come out with a set of stamp sets that fit PERFECTLY on candy such as hershey kisses, rolos, mini peanut butter cups and more!! 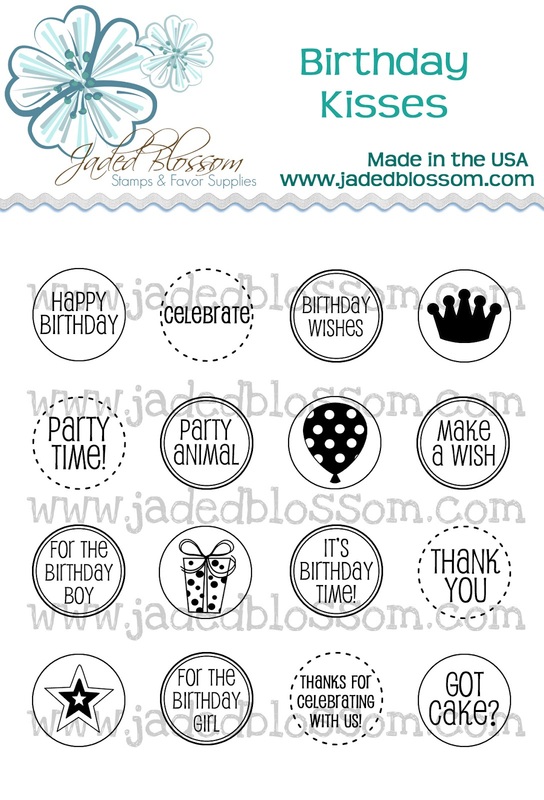 These circles can be easily punched out using a 3/4 inch circle punch that you can get anywhere. I got mine from Stampin Up but I've also seen them at Hobby Lobby and everywhere online. I cut the bag and the leopard out from Silhoeutte Studio. 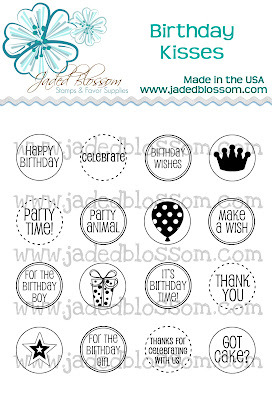 The stamp "party animal" is from Birthday Kisses. And here is what is inside.. 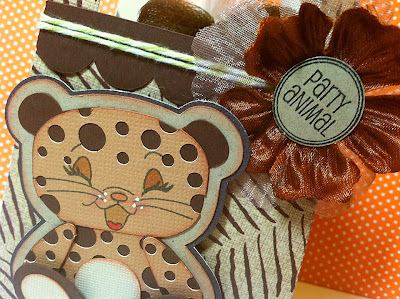 I used the leopard stamp from Pattern Kisses and the Party Animal stamp from Birthday Kisses. This weekend only you can get the entire set of all 6 "Kisses" stamp sets for $59.99! Thats a savings of $12!! 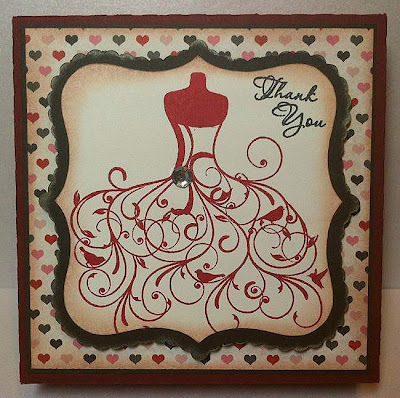 Thanks so much for hoping along on the blog hop! 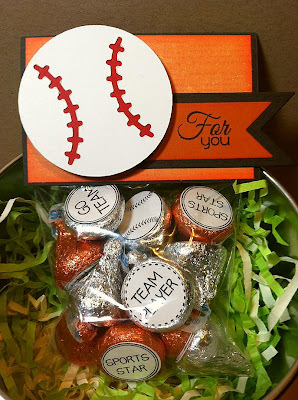 Don't forget about the prizes, Echo Park paper and Twine! Happy Monday! 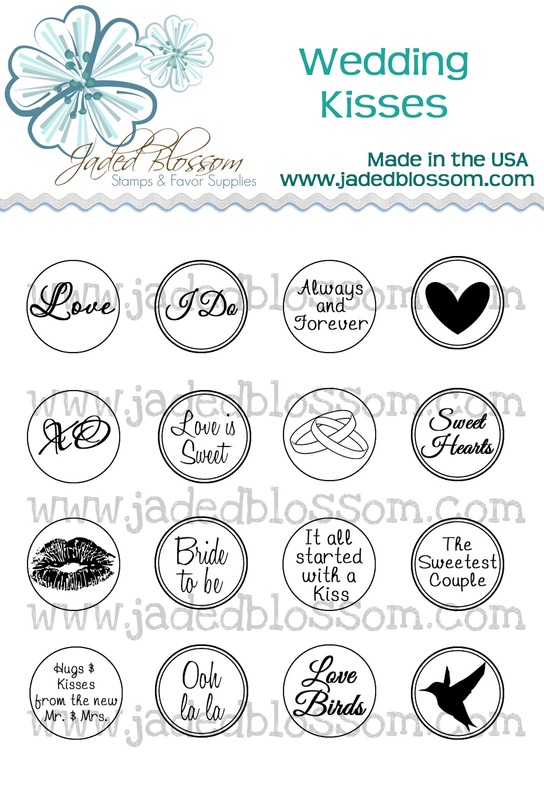 And welcome to Day 1 of the Stamp Release week for Jaded Blossom! 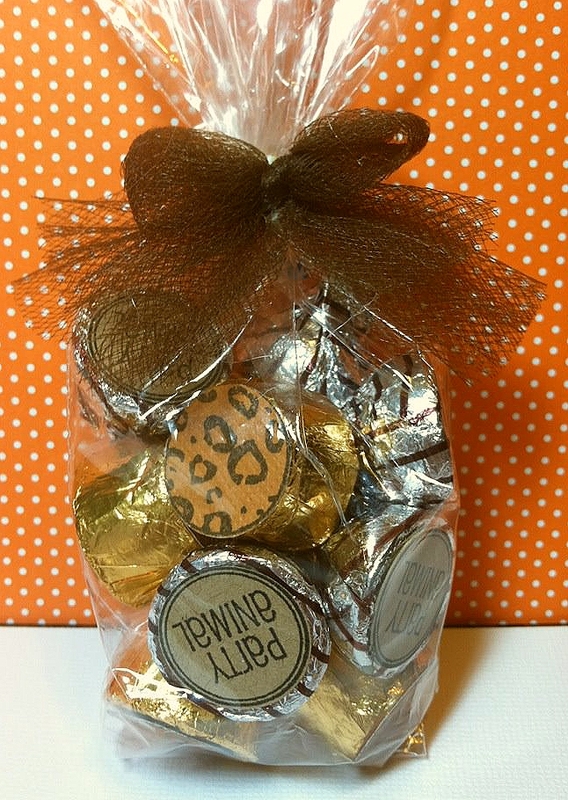 This month its all about party favors!! 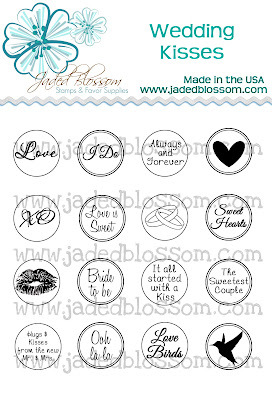 Today both Pattern Kisses and Friendly Kisses were shown on the Jaded Blossom blog. These stamps all fit in a 3/4 inch circle punch. 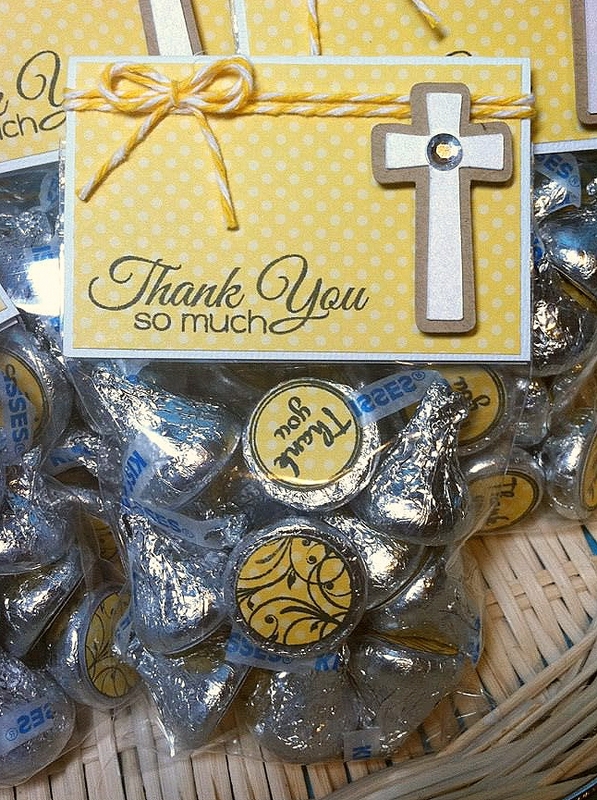 AND fit perfectly on the bottom of hershey kisses an other candies!! The Sun stamp and "Have a sun-kissed day" are both from Friendly Kisses. "Hello" is from last months release "Simple Sayings" These bags will also be carried in the Jaded Blossom store starting Thursday! So what do you think? 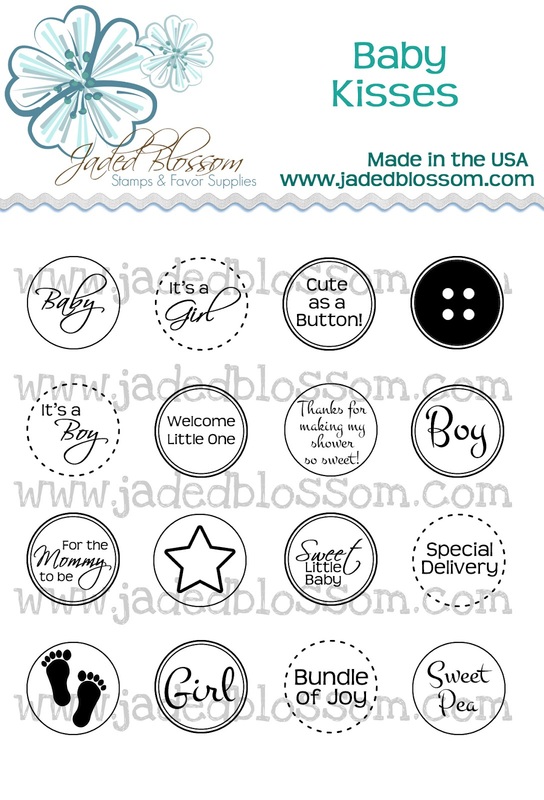 Check out the rest of the Design Team projects by clicking here!